In the mid 2000’s I was playing bass in a rock band. Despite some regional success, this band wasn’t going make it. It wasn’t for a lack of trying. We were very good — but the blown up music industry hadn’t yet settled into the licensing business model that it is today. Bands weren’t yet capitalizing on social media and YouTube, which is an obvious strategy now. We were in No-Man’s-Land. Victims of circumstance. Even with a few years left in my band, I began thinking of what next? I knew that I wanted to have some type of career in music — but the thought of starting another band was daunting — especially in my late 20’s. It was around this time that I was vacuuming my apartment one day, and I noticed a trailer for the upcoming movie, Brokeback Mountain on my TV. The subject matter of Brokeback Mountain would hardly make news today. However, 10 years ago, it was very controversial. I immediately took notice of the guitar music in the trailer. I’m actually not a fan of instrumental guitar music (I know right?) but I was captivated by what I had just heard. 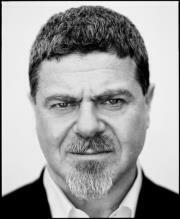 And thats it — in under a minute I became a Gustavo Santaolalla super fan. Moreover, I began to think of myself as an instrumentalist too. Maybe I could create music for solo guitar that I actually like — and others might too. The beginnings of Intellimusica had begun to take shape in my mind. So, whenever I need to find inspiration for my own guitar playing, I always go back to Gustavo Santaolalla’s film work to re-calibrate. In that respect, Santaolalla is definitely a musical mentor of mine. The Motorcycle Diaries soundtrack is still epic to this very day. It’s truly is the music of the road. If you have a road trip coming up, I highly recommend this album. The music will perfectly blend into the scenery outside your car window. There’s a sense of destiny to the whole thing. Cabalgando is a very simple strumming tune based around an E and A position. This is a great song for beginners to practice different strumming patterns. The bridge section will take you though both open and bar chords — so it’s a great way to also build skill in the realm of chord transitions. You might also like my version of Santaolalla’s Apertura, and Relatos Salvajes. Please comment to let me know what you think, or if you have any questions.